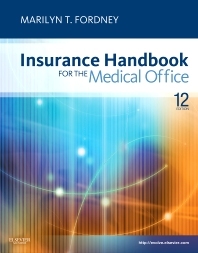 A complete guide to the latest in insurance billing and coding, Insurance Handbook for the Medical Office, 12th Edition covers all the plans that are most commonly encountered in clinics and physicians' offices. An emphasis on the role of the medical insurance specialist prepares you for success in the workplace, including areas such as diagnostic coding, procedural coding, Medicare, HIPAA, and bill collection strategies. Learning to fill in the claim form accurately is made easier by the use of icons for different types of payers, lists of key abbreviations, and numerous practice exercises. Written by insurance billing expert Marilyn Fordney, this comprehensive, market-leading resource has been trusted for more than 30 years. Block-by-block explanations and examples demonstrate the correct way to complete the CMS-1500 claim form. Compliance Alerts and a HIPAA Compliance and Privacy in Insurance Billing chapter highlight important HIPAA compliance issues and ensure that you are aware of, and compliant with, governmental privacy regulations. A guide to receiving payments and to insurance collection is provided in separate chapters. A Medical Documentation chapter covers the principles of documentation and shows how proper documentation can prevent penalties and refund requests, and help you prove compliance in the case of an audit or review. Guidelines for the filing and submission of electronic claims prepare you for the industry-wide transition to an electronic environment. Form icons and Computer icons ease the transition from paper to electronic filing. Service to Patient features offer examples of quality customer service. Seeking a Job chapter gives tips and techniques on securing that first job. Key points summarize important chapter content. Key terms are bolded at first mention, defined, and emphasized throughout. A companion Evolve website enhances learning with performance checklists, self-assessment quizzes, and the Student Software Challenge featuring cases for different payer types and an interactive CMS-1500 form to fill in. A workbook contains learning tips, review questions, practice exercises for key terms and abbreviations, study outlines, performance objectives, a chapter with practice tests, and critical thinking activities for hands-on experience with real-world cases. Available separately.